All I can say, is get to the Great Barrier Reef as soon as humanly possible, if you are planning onever seeing it. It is true that most of the reef is dying and becoming bleached from pollution and damaged from climate change. If you are a non-believer in climate change, check out how our ocean's largest reef is handling it at the Great Barrier Reef... you'll be a believer. I don't want to scare you from spending your money to go see this magical place because it's epic. The Great Barrier Reef is enormous. Australia is enormous and it stretches along the entire northeast coast of Australia. We had a good friend that had family up in the Cairns area so, we decided to see it there. Trips from the Gold Coast were quite cheap, as well, if you bought your flights in advance. There are plenty of boats that will take you the two hours out to see the GBR. We wish we could give you a run down of all them with price comparisons and everything, but a room mate of ours had already done a tour with Rumrunner Tours, out of Cairns, and had nothing but good things to say about it. So, we chose that one. We also have nothing but good things to say about it as well. They were very accommodating to three of the people in our group being vegetarians and vegans, which was unreal awesome! It was a two-day, one-night trip. We stayed on the boat and they cooked all our meals. Beers were $3 each; the cheapest beers in Australia. Because we went in the slow season (just before the jellyfish infestation that usually happens over there), they offered all the snorkelers three free dives after a couple of skills lessons and safety exercises. 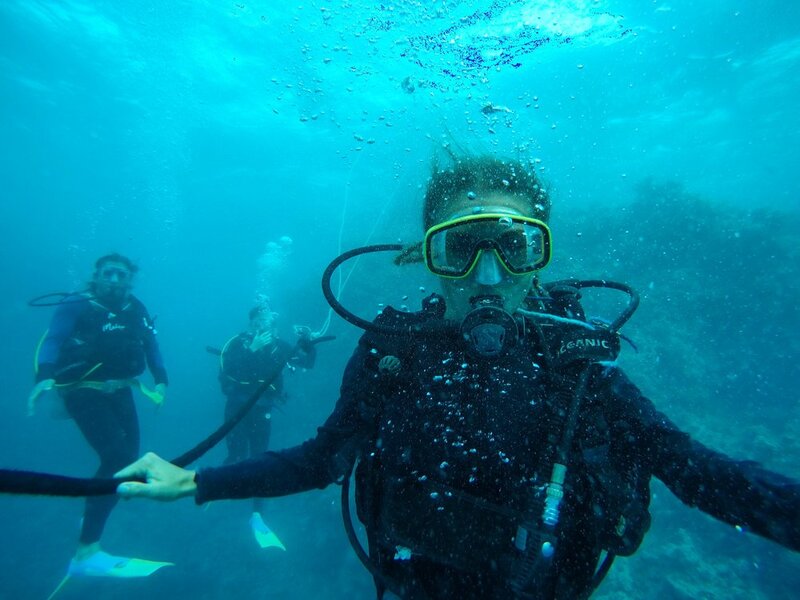 No one in our group had ever done the scuba and we definitely did not expect to learn at the most epic place on earth to learn to dive, the Great Barrier Reef. But, we did and it was unreal. The things you see beneath the snorkel surface were crazy cool. We saw turtles, a color changing octopus, and we swam thru canyons of reef. It was epic. I felt like a mermaid. Another highlight of slow season was there wasn't another boat insight. We had every reef we went to all to ourselves. But, I remember feeling terrible about the way that I felt after our first reef we stopped at tho. I felt like I must be jaded or the GBR had been over hyped. It was grey. The fish were colorful, but the reef was grey. People excited for my trip were telling my how mind blowing it was, as you swam face down looking into the deep dark ocean to the reef. Then, all the sudden, an explosion of colors would rise up out of the bottom of the ocean into tall reef-like skyscrapers with schools of colorful exotic fish swimming about. The only thing right about that statement, in my first experience, was the colorful fish swimming about. I was kinda bummed when we got corralled back onto the ship for lunch. If you aren't able to get the free scuba, I would say that you don't really need to spend the money on scuba. The times that I was snorkeling were some of the times that I saw the coolest schools of fish. Sometimes the bubbles from scuba equipment can scare the fish away. So if you are trying to save money and still have a great experience, I would say stick to the snorkel. You will have an amazing experience anyways!